NETWORK FINALS: There were some significant adjustments due to local NFL preemptions. 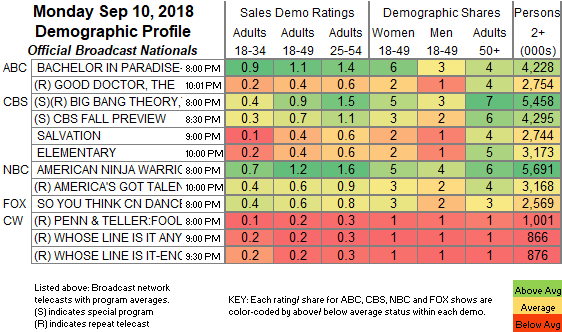 ABC’s BACHELOR IN PARADISE fell 0.3, and the rerun of THE GOOD DOCTOR was down 0.02, while the entire CW line-up was down 0.1. CABLE HIGHLIGHTS: The season premiere of ESPN’s MONDAY NIGHT FOOTBALL was as usual a doubleheader, and at 3.78/3.68, it was below 2017’s 4.21/3.94. VH1’s LOVE & HIP-HOP gained 0.03 to 1.02. USA’s WWE telecast was at 0.91/0.89/0.88, compared to last week’s 1.00/0.97/0.95. On Bravo, REAL HOUSEWIVES OF ORANGE COUNTY returned at 0.58. 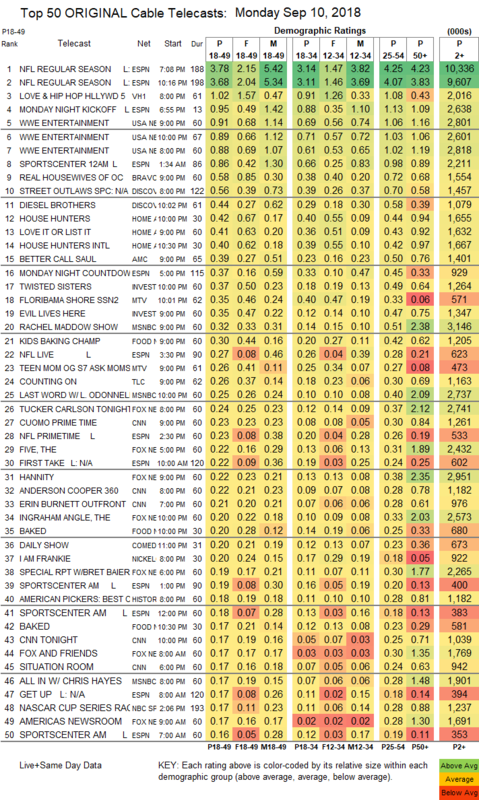 On Discovery, STREET OUTLAWS dropped 0.05 to 0.56, and DIESEL BROTHERS was up 0.07 to 0.44. On HGTV, HOUSE HUNTERS jumped a tenth to 0.42, LOVE IT OR LIST IT had a 0.12 bump to 0.41, and HOUSE HUNTERS INTL was up 0.07 to 0.40. On AMC, BETTER CALL SAUL lost 0.04 to 0.39, and LODGE 49 was up 0.02 to 0.10. On ID, TWISTED SISTERS was steady at 0.37, and EVIL LIVES HERE was up 0.02 to 0.35. MSNBC’s RACHEL MADDOW SHOW led cable news at 0.32/0.51/3.1M, with Fox News’s TUCKER CARLSON TONIGHT at 0.24/0.37/2.4M, and CNN’s CUOMO PRIME TIME at 0.23/0.30/1.3M. On MTV, FLORIBAMA SHORE climbed 0.04 to 0.35, and TEEN MOM was down 0.11 to 0.26. On Food Network, KIDS BAKING CHAMPIONSHIP edged up 0.02 to 0.30, and BAKED was at 0.20/0.17, compared to last week’s 0.16/0.13. On TLC, COUNTING ON gained 0.05 to 0.26, and LITTLE LIFE ON THE PRAIRIE was up 0.04 to 0.16. REST IN POWER returned to BET at 0.06/0.10, and on Paramount, the single episode was down 0.05 and off the chart at 0.04/178K. To search for a show: type Ctrl-F and type your show title in the search box. MITCH METCALF has been tracking every US film release of over 500 screens (over 2300 movies and counting) since the storied weekend of May 20, 1994, when Maverick and Beverly Hills Cop 3 inspired countless aficionados to devote their lives to the art of cinema. Prior to that, he studied Politics and Economics at Princeton in order to prepare for his dream of working in television. He has been Head of West Coast Research at ABC, then moved to NBC in 2000 and became Head of Scheduling for 11 years. "Let's compromise and call it: "Bless This Mouse" :o"
"OK, which is it Bless This Mess, or Bless This House? You keep writing both in your rev..."
"Those CW numbers are likely inflated by the NYC preemption for Yankees-Red Sox." "MLS on ESPN2 - 5 et (Minnesota vs NYC)?" "That's rather more of a request than we would handle here. But it's irrelevant, becaus..."
"It's a shame this episode of Into The Badlands didn't do better. Probably not even well..."
"Do you have the ratings for the following shows on the Disney Junior channel that day: ..."